Designed in the classic style of a Mexican hacienda, the all-inclusive Occidental Cozumel is located on the idyllic island of Cozumel, just a 45-minute ferry ride from Playa del Carmen. Perfectly integrated in its natural surroundings of mangroves, white sand beaches and tropical gardens, the resort delivers a relaxing and lavish experience from check-in to checkout. It also offers easy access to one of the top five scuba destinations in the world – Palancar Reef – where divers will swim among coral reefs and sea turtles. Guests will also enjoy a wide range of other sports such as kayaking, sailing, snorkeling and water polo, as well as fully equipped facilities including three pools, a spa and sauna with several customized treatments, gym, five bars including a disco and seven restaurants. For an elevated vacation experience, upgrade to Royal Level, offering a host of unique and exclusive services. 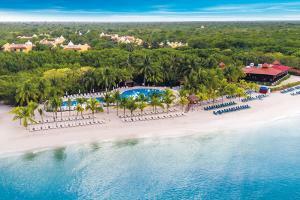 Located about 25 minutes from the international airport and a 35 minute ferry ride from Playa del Carmen, Mexico. Wild Tours, Playa Palancar, Playa Mia Grand Beach & Water Park, Scuba Diving, Snorkeling, Wind Surfing.